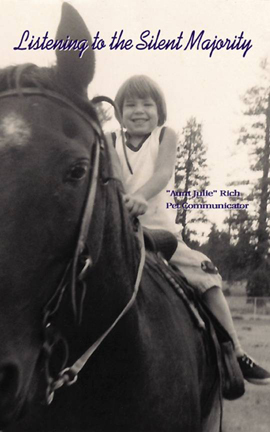 Welcome to Aunt Julie's Pet Communicator Web Site! Yes, I can actually "get" what your pet is trying to tell you! Meet Fox Mulder Rich - My Baby! 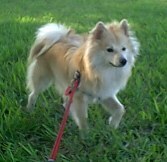 Ask me how YOUR pet's picture can be on my web site too! "It's almost like we have a new person (dog) in the house. You are a miracle worker." HIGHLY RECOMMEND! She knows what they are thinking..OMG!!! TRY HER! WOW! My cat & I are glad we found you!!!!! "AMAZING! Thank you Julie for an accurate and helpful session. 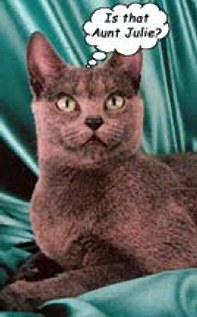 Blessings :-)"
"I've had other 'pet readings' done -- YOU ARE THE BEST AND THE REAL THING!" "Amazing experience! Caring, devoted to her work/animals. Do if you love your pet!" "Enjoyed the talk, and I feel now we can be helped. Thanks Julie." "Very friendly and caring! Great, detailed and interesting pet reading!" "I really enjoyed it and it gave me a lot to think about." "Not only 20 Golden Stars! Rate Her with the ...galaxy! " "Truly a friendly and caring person. Really an amazing experience. Thank You!" " I swear that there's a noticeable difference in her behavior since you and she 'chatted'. She's been ever soooooo much more affectionate with me, following me around and lying down right in my path. She's always been affectionate, but recently she's become much more expressive. My husband's even noticed how much more responsive she is to me." "This was a amazing experience. 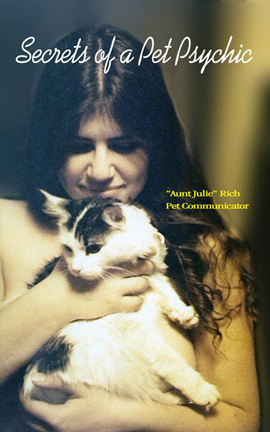 Julie is a wonderful person very easy to talk to"
"Gracious and professional host - pet reading valuable & highly recommended"
"WONDERFULLY GIFTED! HIGHLY RECOMMENDED! MY PET AND I ARE VERY THANKFUL! " "Aunt Julie is the BEST! We wouldn't know what to do without her services!" "Fantastic!!! She knows her stuff and I couldn't be happier!" "I really appreciate your help with both kitties." "Thank You again for making my perfect dog so much happier"
"MY PRAISE TO YOU!!!! I don't know how you do it???????" "What a fabulous reading! Thanks so much, this is so helpful to try to understand him!" "Great reading!! Answered my concerns about my cat"
"Some of the things he used to do make more sense." "I really appreciate your devotion to this dog." "I was amazed from the beginning...!" "Just wanted to say--you/he make me cry. He's so proud of himself and I'm so grateful that he could connect with you." "AWESOME!!!! Aunt Julie is great and right on the money!! Thanks." "Thank you Julie for bringing my little one closer to me than ever." "I had no idea he was able to pick up on that!" "Boy, if anyone ever had any doubt about your ability to communicate with the animals ~ after something like this, there is NO way they could EVER doubt it again!!!!" "Just want to say a quick THANKS for being there for both of us! I know it means so much to D, and to me as well. He's just so smart and he needs to know people get him--I think it would be so much harder for him with all his intelligence if he didn't feel like he could communicate this way. And of course, it's helping me SO much to understand where he's coming from. So thanks again!!" "Excellent and informative pet reading!! Superb communication! Thank you!!!!!!!!" "She relayed messages from him about things she could not have known about him." "This lady is awesome and can do wonders with your pet. She's NOT a fake." "Very Nice to work with! Super friendly!! Very Insightful!! You've gotta try it!" "Julie is unbelievable - Things only my dog could know!!!" "What a Great Experience! Her insight is on the mark & she's very professional." " I am so utterly astonished, I can't even come close to expressing it." "Immediately after the Consultation with Julie, I saw positive changes in both dogs behavior, mood, and interaction with me and the family." "WOW - ABSOLUTELY 100% ACCURATE!! EXTREMELY DETAILED READING -JULIE IS INCREDIBLE! " "Accurate beyond description, great help with better understanding my pet." "Thank you so much...it has been quite an adventure and a learning experience and quite amazing too!" "The most incredible experience ever!!! I am so happy I found you!" "You amaze me! You have powers or something that most of us don't even dream about! " "FANTASTIC! Beyond accurate & insightful. I will be a regular client. Thanks!" "REAL PET COMMUNICATOR!! Thanks again :)"
"T- has been affectionate to me since the reading - even lingering to let me pet her more!" "Excellent reading, I was told things only an owner would know." "All in all, I think our Consult has made a huge difference in S- and she's much happier these days. I really appreciate your help with sorting out her issues and getting us headed in a new direction...one where she's going to be happy." "After having her talk with my cat D- I am a true 100% believer." "You just changed 12 lives. Bravo!" "About 3-4 years ago we contacted you after T- had urinated on our leather sofa. Since then we've had no problems with the sofa." "You were able to tap into and read all three individual personalities." "Another GREAT reading. Very healing. She's the real deal. Thank you Julie!" "I can't say 'thank you' enough. You've been a complete blessing through this whole thing. I'm sure God blesses you for your kindness, compassion, and for the help you give to humans and animals. Thanks for everything. I don't know how we would have made it without you." "She was and is an incredible and precious little companion. Bless her and bless you for making your precious communication ability available to pets and their human companions at those times when nothing else can help." 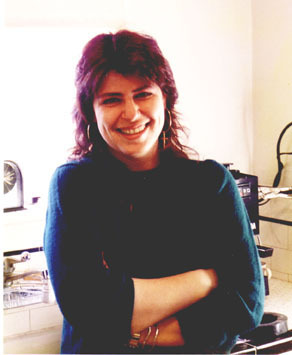 "Aunt Julie helped me through an extremely difficult time in my life--she made it easier, and gave me great peace." "You gave me such a feeling of peace and for that I am grateful." "I admire your special gift and you have helped me through so much, everything I have gone through in the past few months is more or less a tragedy to me. I am so glad I found you." "I appreciate your assistance with this. It has helped to close an open hole." "I can't tell you how much it has really helped me! Its like that heavy weight was so lifted and it just isn't there anymore. Its wild." "I am very happy he is now at peace and happy." "I'm at peace knowing she is happy." "Julie is 'the real thing'. She helped us tremendously with our loss"
"You are the one that makes it possible for us humans to make the decision that would be impossible without the information that you bring forth....GOD BLESS YOU, my Friend...and we do need you. Hell, the whole world needs you...."
"Thanks again for help that is beyond words. I couldn't do these things without your help. My hounds would suffer needlessly and so would I. 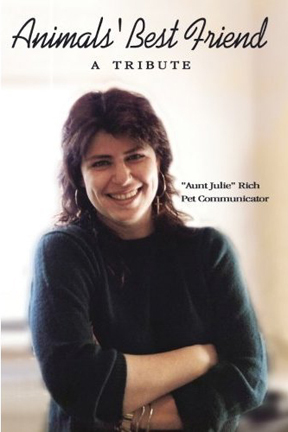 We love you Aunt Julie..."
"With her incredible gift, Julie drew on, understood and was able to communicate aspects that yes, no one else would have known without any guidance. " "Insightful reading. Genuine, accurate, helpful. I'll treasure this experience!" 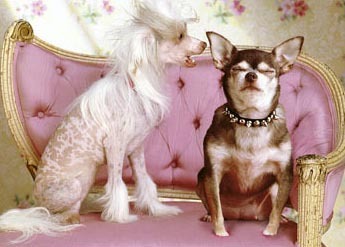 A real, actual Pet Communication is NOT about whether or not they prefer Alpo or Iams. It's about who they are and what they're about...or AUNT JULIE didn't do it!